This module describes an extension of the page model that partitions a flow into pages. It adds to Paged Media Level 3 features introduced by other modules like CSS Regions or CSS Exclusions and Shapes: content flows, exclusions, more powerful headers and footers, etc. It does not deprecate nor obsolete Paged Media Level 3 but is designed to live gracefully with it. This is a public copy of the editors' draft. It is provided for discussion only and may change at any moment. Its publication here does not imply endorsement of its contents by W3C. Don't cite this document other than as work in progress. Convergence between electronic books and Open Web Standards requires new features related to pagination and page layouts. If CSS Paged Media Level 3 paved the way, extension of its page model is now needed to provide the industry with solutions more in line with the new usage modes of Web Standards on one hand, better integrated with the state of the art of CSS on the other. This module describes how other CSS modules like Regions, Grid Layout, Exclusions and Shapes can enhance the page model for a better pagination on the Web and on print. All of the text in this specification is normative except sections explicitly marked as non-normative, examples, and notes. The keywords "MUST", "SHALL", "MUST NOT", "SHALL NOT", "REQUIRED", "SHOULD", "SHOULD NOT", "RECOMMENDED", "MAY", and "OPTIONAL" when used in this document are to be interpreted as described in RFC 2119 [RFC2119]. However, for readability, these words do not appear in all uppercase letters in this specification. 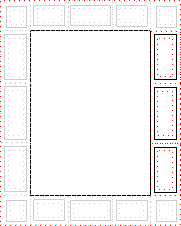 and finally the page area containing the boxes generated by the flow of the main contents of the document. It's is possible to flow content, for instance page headers and footers or footnotes, into a page-margin box using features introduced by the CSS Generated Content for Paged Media Module [CSS3GCPM]. It is also possible to define multiple page templates for a single document using the @page at-rule that allows to select the first page, left pages, right pages or named pages of a paginated flow. the 16 page-margin boxes are an extension of the print features offered by desktop browsers. Desktop browsers usually offer control over 6 page-margin boxes only. Only one desktop browser claims implementation of the page model described above in the fourteen last years. The other desktop browsers' control over the 6 page-margin boxes is then not achieved through the cascade of CSS UA stylesheets. no editing environment available on the market and in particular Wysiwyg text editor (for instance like Microsoft Word) implements such a box model. it's not possible with the current model to position headers and footers (for instance the HTML5 header and footer elements) arbitrarily in the page area. the @page at-rule currently allows nested at-rules only for the definition of page-margin boxes. 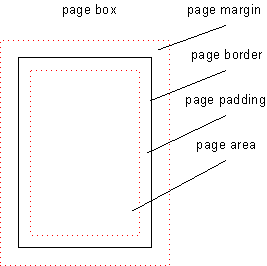 Similarly, the set of CSS properties applicable to a page box is limited and it is impossible in this model to use CSS Regions Module Level 3 [CSS3-REGIONS] to flow content into a given predefined area of a page, exclude an area from the page using CSS 3 Exclusions and Shapes Module [CSS3-EXCLUSIONS], lay out the page area into a grid using CSS Grid Layout [CSS3-GRID-LAYOUT] or using @slot rules that were discussed multiple times by the CSS Working Group in the recent past. The successful electronic book editing environment of Apple Inc., iBooks Author, already allows @page rules to specify arbitrary slots, arbitrary exclusions and shapes, and extends the list of applicable properties; most of its advanced layout capabilities are based on these features. the @page rule of CSS 2.1 [CSS21] is intended for use on print media, not dynamic media. The spread of complex HTML-based slideshows and electronic book viewers has shown that the Page Model should also apply to screen media and alike.